I feel as if I have died and gone to biscuit heaven when we walked past this biscuit shop that was a couple of doors away from Casuarina’s Curry Restaurant. Called Biscuit King, the sales person of this shop was a tad brusque and arrogant which upsetted my mum who left in a huff after paying $4.20 for 300gm of cookies. Mum had wanted another packet of the milk cookies as she firmly believed the last packet must be “not fresh” – the brusque lady told her it was fresh and that was final! I guess she is the biscuit monopoly and need not worry about competition. These tins lined the walls! Besides Little India’s Race Course Road, there are 2 other enclaves that sell fish head curries and accompanying sides like prata that comes in normal plain or paper prata. These are at (1) Old Upper Thomson Road’s Casuarina Indian Curry Restaurant and (2) Jalan Kayu. Of course there are the top end restaurants at Dempsey’s Muthu’s Curry and Samy’s Curry Restaurant. Tonight, Bro took mum, dad and I to Casuarina. We ordered a large fish head curry, medium sides of spinach, cabbage and cauliflower cooked in spices. Total bill $51.10! Relatively reasonable I thought though the place has the ambience of eating in India. Hard flooring, basic tables and chairs and din that followed. We cannot hear ourselves talk amidst the youngsters screaming in laughter or shouting and the service staff shouting instructions on orders. A Fish Head Swimming In Curry - Doggone Where's The Body? Spinach Boiled In Spices! Even Toothless Can Eat! Curried Cauliflower, Perfect For Seniors Without Teeth! Today was a killer Monday! Rummaging my fridge I found some food and ate it. Simple yet good enough. As I wind down, I realised my work load is terribly heavy. But Electrical Lord did not think so UGH! I was given a safety portfolio. This means, I have to manage risks to comply with and ensure compliance with relevant government agencies. My umbrella of duties is a far reaching one. If I think positively, it seems Electrical Lord thinks I am capable. If I think negatively, it means major exploitation of me, myself and I. Plus, Electrical Lord thinks I am Super Woman….Wonder Woman all rolled in one! I am also to look after IT and manage the entire group of companies. Hiring replacements that are swiftly terminated by doggone weird head honchos. I am “breathless” running this “hiring” marathon. It is a job….a challenging and non stop job from dawn to twilight….actually…. Gaaarrrfield where are you?! I need a Garfield hug and the weather is a sweltering 35C!! Ugh!! Dinner….Much Too Much To Eat Today! Curry Ramen Was Not Great!! Eating at Curry Times, Changi Airport Terminal 3. Petai fried with ikan bilis in sambal. Ngoh Hiang – spring roll like except filled with minced prawn and pork wrapped in bean curd skin. Fried french beans in sambal (chilli). Bubur cha cha – sweet potato and yam cubes cooked in coconut milk with sagu. Ice kachang – shaved ice topped with red, green syrups on top of a mound of red beans stewed in sugar and ata seeds! Yum to the last morsel. Dad paid $91 for 4 of us. Bro had a capuccino and I had a latte. I forgot to take photos of the Wagyu Burger I had and Wagyu Steak that my bro had! Too hungry and dug in! We then dashed off to watch Minions 2!! After my walkabout through Electrical Lord’s assets, I landed up at Chong Boon Hawker Center, along Ang Mo Kio Avenue 10. 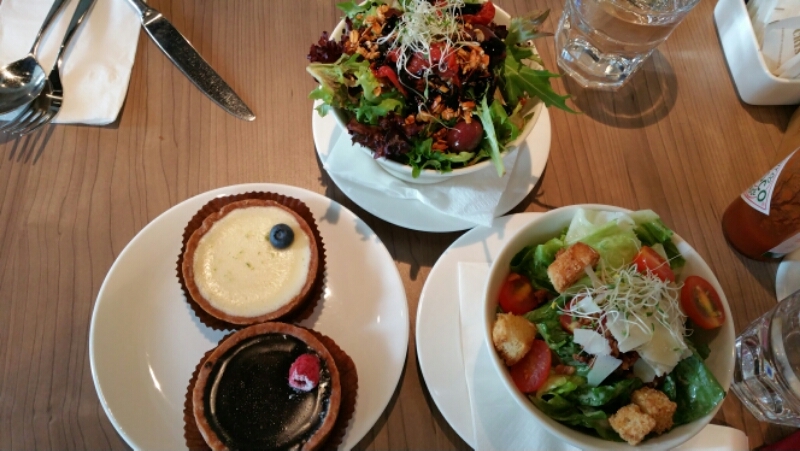 Lunch time and I had my family with me except mum. She had visitors at home. Lunch menu was exciting as there were lots of yummy eats to choose from. Bak Kut Teh, claypot Pork Trotters, Hokkien noodles….the best choice of the day for my bro and dad was Kway Chap. Kway Chap is a plate for 2 comprising mixed items like a hard boiled egg cooked in soua sauce, pig intestines, pork, doufu and pig skin braised in soya sauce served with a bowl each of flat white noodles. Reasonably priced at $7 for 2 pax. Dad said the chilli was spicy and vinegary which matched the food perfectly. I settled on a bowl of doufu curds without sugar! I was saving for a bite of nonya kuehs at M’s place after. I had also asked her to kindly boil barley water for me. In the center is ondeh ondeh – little balls of sweet potato flour wrapped over gula melaka or brown sugar and rolled over freshly grated coconut. The wedges of green pandan chiffon cake was soft and springy. Literally, you can squeeze it and compress it into a ball and eat it. My favorite! The green long spring roll is actually kueh dadah made of a crepe like texture wrapping coconut shreds cooked in gula melaka. 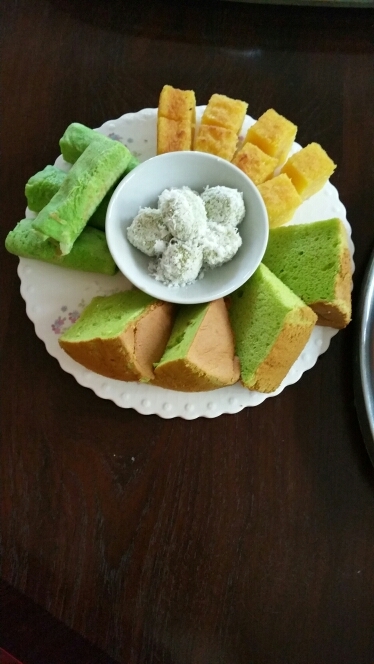 The yellow pieces that you see in the photo I took is Kueh Bengkar – tapioca cake. It is always fun to catch up with M and her family. It was my weekend therapy before I start my hectic Monday again! ‘Tis Saturday as Shakespeare would quip! This sot is off to be Secret Squirrel, the one with the evil eye to see sloth, greed and other components of the 7 sins! Electrical Lord only wants to ensure no sloth or greed. He abhors slackers. I look at it positively. It trains discipline. Sloth and greed are undoubtedly bad traits of characters. But in extremes, it is misconstrued as exploitation which is no lesser than the sweat shops of the old days. Electrical Lord’s biggest beef is seeing minions using the tablets or hand held devices when they should be focusing on work. “You’re fired” – in the exact words of the great Donald Trump in the apprentice and indeed we do have a huge pool of apprentices. My challenge is to replace faster than they are fired. Temp staff or part timers….how do we manage minions who are not here for long haul?! To market..to market this little piggy is off…I sure hope I do not bag the minions and or catch them using smart devices. Hungry, Pigly Scoffing Or Bad Habits? My usual Friday rendezvous with my parents to Changi Airport this evening was a tad more interesting than usual. Mum was feeling better and I needed her to walk. Changi Airport Terminal 3 is to me the best place to walk. Ground is flat and evenly tiled with no gradients. It is fully airconditioned, ample toilet facilities at every turn and most importantly a food court with local cuisines for snacks or a meal. With brother in town from Hong Kong, he drove and I could rest and relax in the back seat and space out from a terribly fast paced and stressful day. I almost did not make it out of the office as I was like a doctor holding clinic and there was a long line of patients, except mine were interviewees. I had planned for a leisurely 4 candidates. Electrical Lord had 4 candidates too. But at the eleventh hour, Electrical Lord delegated the candidates to me to interview. 8 candidates from 4pm! Ugh!! I finally finished and dashed off for home to be picked by my brother at 7pm! Another 12 hour shift for me. Airport visits are also my rest and recreation time. Happily I trotted out to Q for Putu Mayam or “String Hoppers” – Indian dessert made of white flour noodle steamed and served with fine brown sugar and freshly grated coconut. Brother wanted to try Apom with banana in cinnamon. Mum and dad wanted to try fried kway teow and fried black carrot cake. These are great dishes and the Qs are snakingly long. As my brother and father sat opposite me they started observing a lady eating her plate of chicken rice behind me. She was in a row behind me. She uses a lot of napkins. She placed one on seat before sitting on it. She uses one napkin to shield her blouse. She is attacking her big big plate of chicken rice. She looks like she will not be able to finish that big plate of chicken rice. Good Lord! She is spading her rice as if building sand castle from center out of the mound of rice. Like a dog, she is as if digging with her front paws. Rice flying everywhere! I did not dare turn around to watch this. Bro said we should have videoed her eating style. I told him it would be rude though I felt I would get a lot of likes from readers! I chipped in saying..she probably has a digestive problem and has to eat that way! Or like some animals have to chew and spit before re-eating the same. I finally turned around after she left. Truly the table was as if a bovine ate there, snout and all with a huge mess. Hmm…fine dining or banquets she must never attend indeed! Chicken shared this lovely post with me. I pray this never happens to my team of surgeons or to anyone of my medical team. Peace, good health and may all our Guardian Angels and deities take very good care of us. I know things are amiss when I sit and wait for my folks to turn up and they fail to show. As a daughter of theirs, my immediate thought is my dad probably boo booed on understanding that he was supposed to drive over. This is a perennial problem as he always assume that I will drive over, pick them up and send them home. Which, I do actually and probably end the waiting times for he and I, except we are both at opposite ends. A real comedy of errors whenever this happens and dinner is delayed by an hour. I was particularly careful this round as I sent him a text message. On reaching home, I further text him to wait for me by the pool where it is comfy with pool chairs and mum with him can wait. Plus with my brother flying in from HK, he is the designated driver. A purrrfect plan I thought. Messages sent. Reminders sent. Yet, blimey….we both waited at different ends! Ugh!! Sighs…. My concern was more the late timing as it means mum would be famished as by the time we got together, it will be almost 9pm before they get to chow down! Sigh!! My bigger worry is gastric for mum will kick in! I must learn to just simply pick them…..sigh….I thought I could save time as it takes me an hour to get to them! Bah!